← LOUISA MENADUE. Striking For Our Future. The Reserve Bank of Australia issues its first statement on climate change – it’s highly likely to disrupt the productivity and stability and they now include it with the other factors they consider when managing the economy – while schools students across the world strike to draw attention to the failure of current leaders to take adequate action to combat climate change. In Central America, people and governments in Costa Rica and Cuba take climate action more seriously. Earlier this week, Guy Debelle, Deputy Governor of the Reserve Bank of Australia (RBA), delivered what is, apparently, the RBA’s first statement devoted to climate change. In a wide-ranging talk about the work of the RBA, monetary policy and the macroeconomy, and climate change, Mr Debelle highlighted the long term trend toward increasing numbers of extreme weather events, sometimes compounding each other, that exert a destabilising and enduring effect on the economy (compared with previously when less frequent droughts and cyclones for example had a temporary effect on productivity and the economy); the risks to businesses, productivity and the economy posed by not only the physical manifestations of global warming but also the inevitable policy responses to climate change; the increasing investments in renewable energy which are now sufficient to influence the macroeconomy; and the lower risks and costs associated with an orderly transition to a low carbon economy rather than a delayed precipitate chaotic transition. Mr Debelle’s talk was significant enough to feature strongly in the online and print media in the following days with headlines frequently mentioning the ‘warning’ he sounded. I heard Mr Debelle speak and, without wishing to diminish the significance of the RBA making this statement, to my mind his tone was far from threatening (yes, I know, he’s a banker). Mr Debelle was at pains to emphasise that the RBA’s priorities are maintaining full employment, controlling inflation and providing economic stability (with an emphasis on a two-year horizon), and that climate change is only one of many factors that influence productivity and the macroeconomy that the RBA monitors. He was very clear that climate change is a factor (‘a given’) the RBA takes into account when managing productivity (and hence output and employment) and the economy, not something that the RBA has any remit or capacity to influence. Message: don’t look to the RBA becoming a forthright champion for action to combat climate change; it’s not their job. Cuba is highly vulnerable to droughts, hurricanes and sea level rise associated with global warming and voters have recently approved constitutional amendments to ‘promote the conservation of the environment and the fight against climate change, which threatens the survival of the human species’. This complements Cuba’s 100-year plan (Project Life) to combat the effects of climate change. For instance, in contrast to Australia, Cuba is mapping areas at risk of sea level rise and moving citizens out – better now than when their homes fall into the sea. Finally, it’s a delight to pay tribute to (rather than abuse) the school students who organised ‘strikes’ this Friday in 100+ countries around the world to highlight the threats posed by climate change to their futures. They are frustrated and angered by the poor performance of their elders in taking the necessary action to prevent climate-related catastrophes – catastrophes that they will have to deal with when their elders are dead. 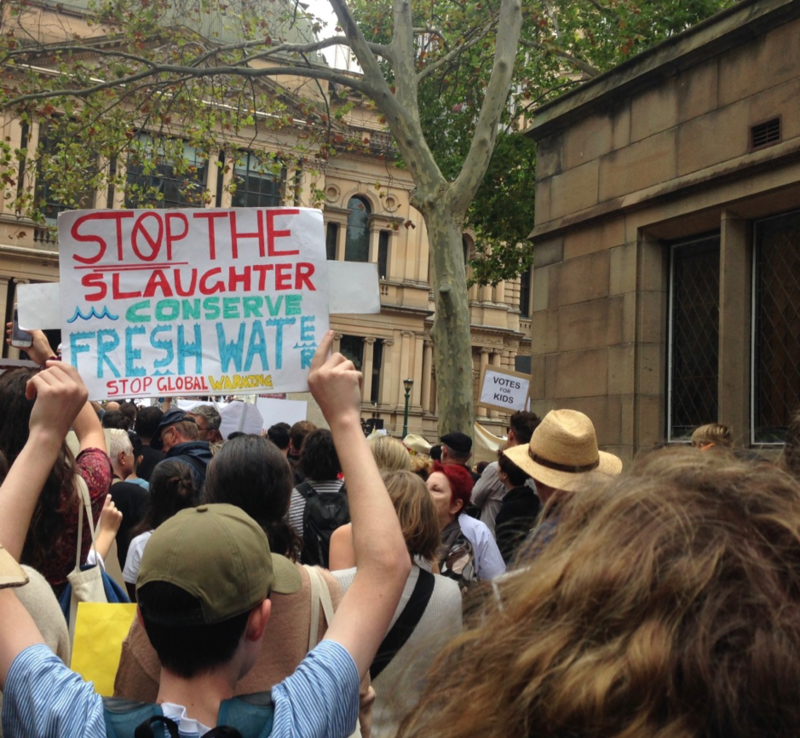 Australian students have three demands: Stop Adani; No new coal or gas; and 100% renewable energy by 2030. George Monbiot has offered some principles to help the young people avoid the burn-brightly-and-fizzle fate of previous popular movements. 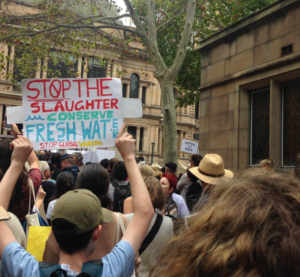 Below are a couple of photos from the very well-attended and lively Sydney demonstration. thanks for your sunday round-up Peter Sainsbury…so many strands brought t0gether with clarity. The school strike in Perth was very energetic and superbly organised. Sadly, getting home to discover the news about the Christchurch massacre was a thumping shock! What an extraordinary juxtapositioning of events. On so many fronts, we need to be not only vigilant, but out-there active!